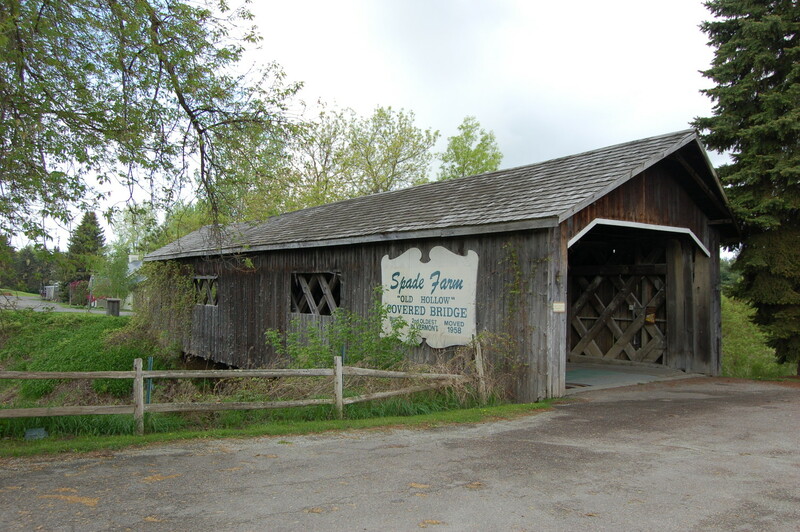 Addison County is home to four of the state's 100 or so covered bridges. 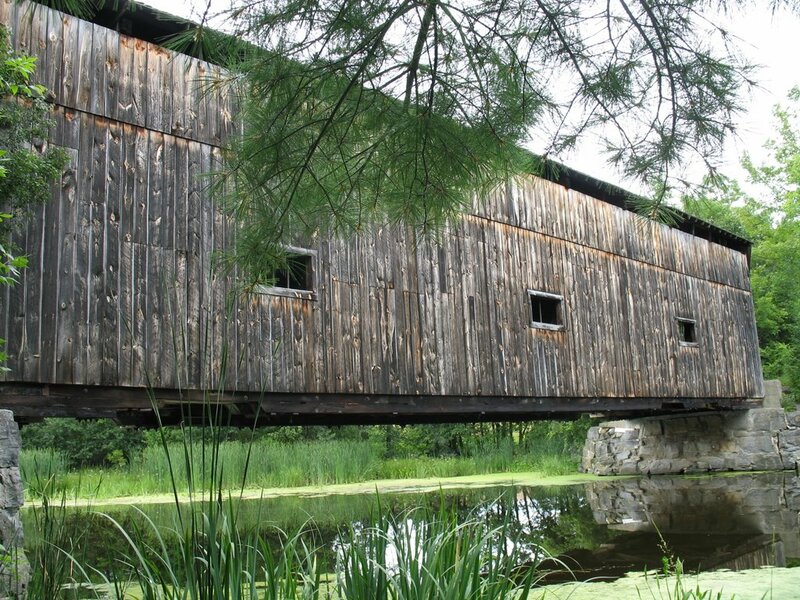 The covered bridge represents one of Vermont's most treasured landmarks. They are historical sites that give recognition to the builders/engineers whose construction techniques changed the science of covered bridge building. The number of covered bridges in Vermont has dwindled from over 500 to fewer than 100 today. Many were uncovered wooden bridges constructed years before it was found necessary to cover them. They were covered to protect the bridges from the elements and to preserve the wooden trusses that make up the bridge. The covering usually does not contribute to the strength of the bridge; it does however make it very picturesque. Actually this was the only part of the construction in which the builder could show his ingenuity in the trimming of the portals and windows. While many were lost to the flood of 1927, significant numbers have been lost to modernization and some to vandalism. The old bridges built of timbers from long-gone forests fashioned by long-gone craftsmen are standing testaments of Vermont's history—links to the past and to a simpler way of life. The four bridges of Addison County are located in the towns of Shoreham, Middlebury (two), and Ferrisburgh. The bridges, being so widely dispersed throughout the county, offer up a unique and scenic tour of Vermont and its small towns and villages. 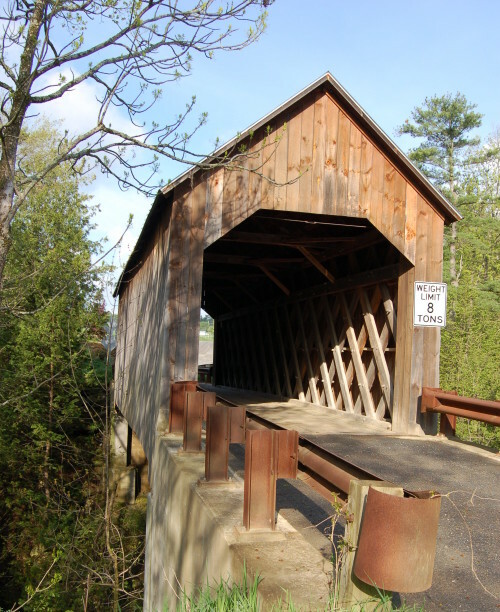 Click here for an interactive map of all of Vermont's covered bridges. Photos to the left are in the same sequence as descriptions below. Located off of Halpin Road in Middlebury (click for Google map), it was built in 1824 and renovated in 1994. It spans a natural water fall and is the highest bridge above a stream bed in Vermont. It is now used only by the Halpin family farm; it was originally built to serve one of the state's earliest marble excavations—the Halpin quarry at Marble Ledge. Located on Seymour Street in Middlebury (click for Google map), it spans Otter Creek and the Middlebury-Weybridge town lines. It was built in 1820, the laminated arch was added to the beam arch in 1860 and it was restored in 1984 and again in 2012. It is a two-lane bridge of three spans and one of only six remaining in the United States. 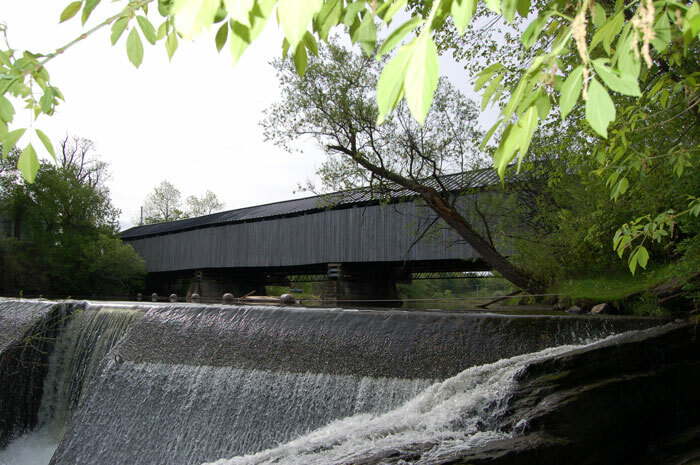 It carries the further distinction of being the oldest covered bridge in Vermont. Located off Depot Road in Shoreham, it was built in 1897 by the Rutland Railroad Company and restored in 1983. Now an abandoned railroad bed, the bridge serves as part of a hiking trail and is one of only three covered trestle bridges still standing in Vermont. Located in North Ferrisburgh (click for Google map) and privately owned, this bridge was built in 1824 on Old Hollow Road. In 1959 it was moved to span a small pond at the Spade Farm to save it from being destroyed by modernization. One of the oldest covered bridges in Vermont it still has the old advertising posters, metal signs, stenciling and so on that were from its former days as a bridge used in times of slower travel. This was Addison County's fifth covered bridge, but completely burned on September 10, 2016. Read about it in the Addison Independent. A temporary bridge has been constructed on Swamp Road in Cornwall and Creek Road in Salisbury to span the Otter Creek. It is unknown if the permanent replacement bridge will be built in the style of a historic covered bridge or use today's construction techniques.